The JPA, or the Java Persistence API, is a special specification which defines how different Java objects or classes access and interact with the data in a Java database. It is one of the many approaches to ORM (Object to Relational Mapping), but now it is accepted as the most standard approach in Java. The term ORM actually refers to the process of mapping, which can be either done with the Java objects, or with database tables. JPA cannot be used on its own, as it is simply a Java specification. To actually use these specifications or interfaces, a proper implementation must be done. There are many different implementations which are free and open-source. JPA also needs a Java database in order to map the objects. JPA can persist and map a large variety of objects, including Plain Old Java Objects (POJO). It doesn’t even need any particular method or interface for different classes of objects, unlike its predecessor EJB 2 CMP, which required additional methods for object classes. Using JPA, the mappings of objects are easily defined either by simple annotations, or by creating an entity using XML. This allows the object to be properly mapped in relation to database. JPA even has different APIs for these definitions, like the EntityManager API for managing XML entities, which are queries running alongside the database. JPL also has a special query language for querying the objects. There are many different types of approaches available to the user for mapping Java objects in relational databases, for example JDO, EJB 2 (the predecessor of JPA), object databases and of course, serialization. So, why do we need another such API at all? This is because most of these frameworks have many different problems. JPA, on the other hand, is made by adopting all the advantages of these specifications and merging them to a separate API which doesn’t require any of them. Some of the disadvantages of these APIs are given below. JDO: JDO is considered as one of the best tools for object mapping. It has nearly all the features that JPA has, and is also very easy to use. However, it lacks a very important feature of JPA, i.e. it supports only non-relational databases, which renders many of its potential usages obsolete. On the other hand, JPA supports both relational and non-relational databases. Serialization: This is the built-in function of Java which allows the transformation of objects into data. This is an extremely easy to use function. However, it also lacks many features of third party specifications. It cannot handle large amounts of data as it needs to store the entire object graph even while working on a single part of the graph. Also, it lacks data integrity as it cannot undo changes made while updating. Another major limitation of this framework is that when many different threads are accessing the data on the server, they conflict with each other, harming the system stability. Thus, serialization has very limited use in application development. The architecture of JPA consists of different components like EntityManagerFactory, EntityManager, Entity objects, orm.xml file and persistence units. The JPA architecture is based completely upon the Java programming framework, which includes both the EE and SE environments of Java. Also, the architecture includes a query language known as JPQL. Now your environment is ready to write JPA classes in Java. In the next section we will create some sample applications. 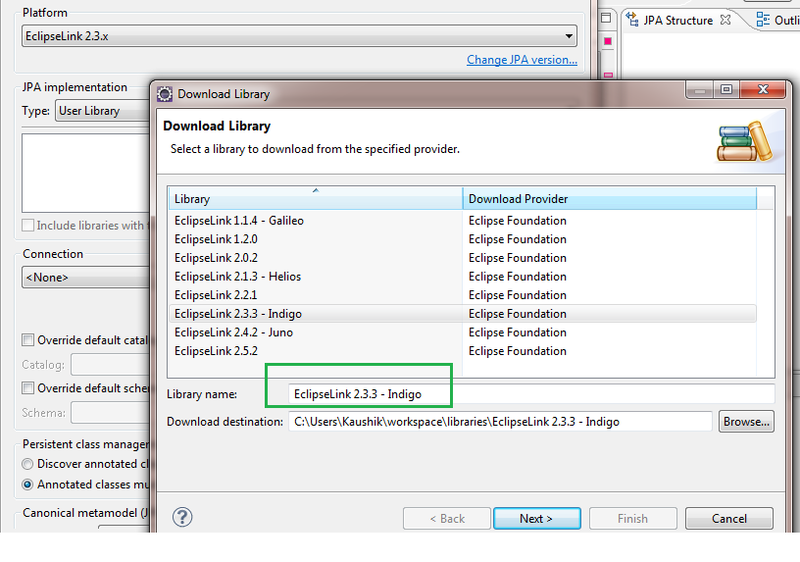 In this example we will create a sample JPA application in Eclipse IDE. 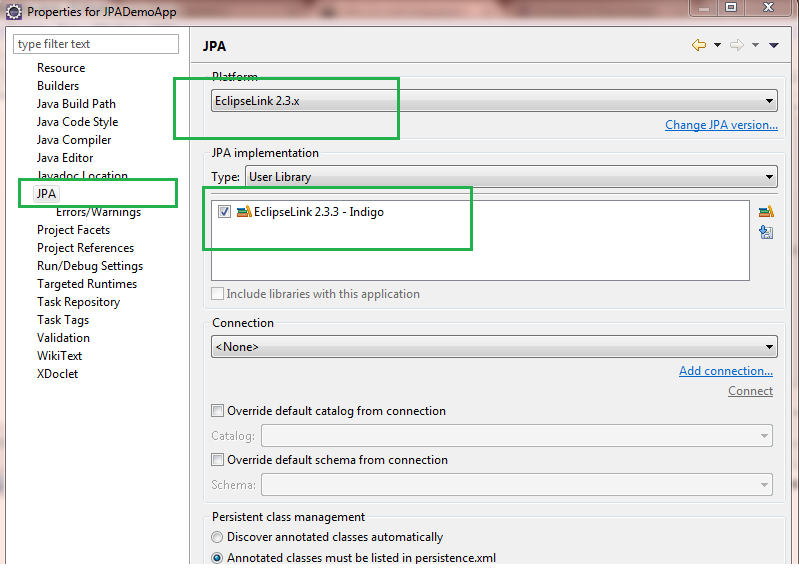 First create a JPA project as shown in the screen shot below. Now, Download the Eclipselink as shown in the screen shot below. 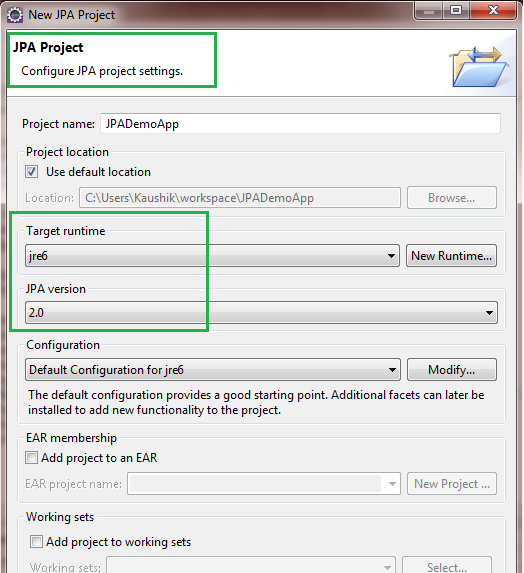 This is required for the JPA APIs in the project. ← Steps to work with Java generics?